This Sunday after Las Vegas, another mass murder. The biggest ever in the U.S. And another debate over whether to debate gun control, both parties in their usual corner. Republicans. We're not going to talk about that today. We can have that discussion at another time. This morning, my interviews with Democratic Senator Dianne Feinstein. America is a gun-happy country. And with Republican Congressman Steve Scalise, who himself was seriously wounded by a gunman earlier this year. Let me ask you this philosophically. Is there a limit you believe that the right to bear arms is unlimited? Plus, should he stay or should he go? Despite reports, Secretary of State Rex Tillerson insists he has never considered quitting. I serve at the appointment of the president, and I am here for as long as the president feels I can be useful to achieving his objectives. But how long is that? I'll talk to a top administration official Mick Mulvaney. And Hollywood harassment in Harvey Weinstein. Why was the producer's alleged harassment of women kept quiet when so many people seemed to know about it? Joining me for insight and analysis are Hugh Hewitt, host on the Salem Radio Network, NBC News White House correspondent Kristen Welker, Eugene Robinson of The Washington Post, and Carol Lee, national political reporter for NBC News. Welcome to Sunday, it's Meet the Press. 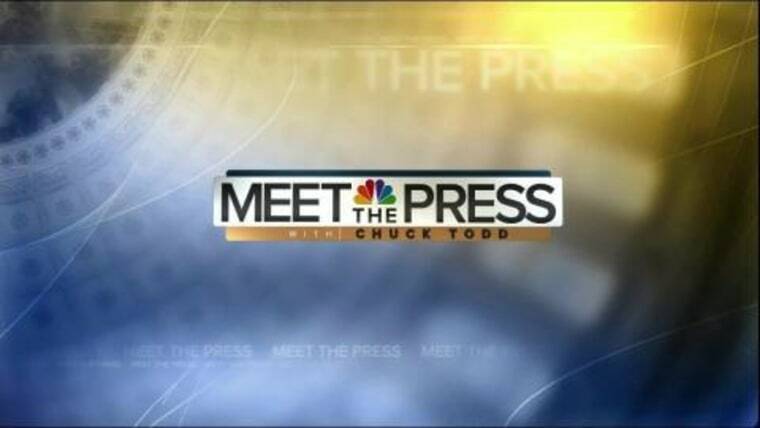 From NBC News in Washington, the longest-running show in television history, celebrating its 70th year, this is Meet the Press with Chuck Todd. Good Sunday morning. In so many ways, there's a wash, rinse, repeat feeling to this entire week. A sense that we've been here before. One of those stories in one corner, there is a by now familiar White House chaos story brewing. Is President Trump angry at Secretary X? And is Secretary Y on his way out? And how long will the chief of Staff last? We'll get to some of that administration intrigue later in the broadcast. But the other big story, and in the other corner of this big news week, is the predictable debating about debating gun control. This is in the wake of another mass shooting. This one happens to be the worst one in American history. One man who is sadly familiar with gun violence is Congressman Steve Scalise of Louisiana, who was severely wounded in that baseball practice shooting back in June. Well, Scalise returned to Congress last week to a hero’s welcome by his colleagues. And, like many Republicans, he is a big supporter of gun rights. This week I had a chance to talk with him about gun violence in the country and what -- if any -- when it comes to limits there should be on the right to keep and bear arms. Congressman Scalise, welcome to Meet the Press. Great to be on, Chuck. I'm excited to be sitting here face to face, interviewing you, considering everything have been through this summer. I've got to ask you, do you have a sense of normalcy yet? Do you look forward to the moment where you won't think about it every day? You know, it's not that there are bad thoughts that I think of, because there was so much good that came out of a bad act. I mean, the love, the support, the prayers from people all around the country, it touched me and my wife Jennifer in a way that, you know, maybe we never would've imagined, because it was so overwhelming. And such a good sign of America that you don't see a lot, but we felt it directly. Let's move to the big issue that's popped up this week, obviously the tragedy in Las Vegas. And there's been this debate about when to have the debate. Why do you make the case that it's too soon to have a gun control debate? I would first say that we've had a gun control debate for a long time. I mean, you look at the presidential race, the N.R.A. had never endorsed that early when they endorsed Donald Trump because they knew there was a clear contrast. Donald Trump was supportive of gun rights, and Hillary Clinton wanted to limit gun rights. Do you feel as if this issue of mass shootings is a problem that the federal government has to figure out how to solve? I think over the years you've seen Congress address different components of it. One of the things that we've seen in some of the past shootings is that there were serious problems in the mental health community throughout our country. We didn't do a good job of tracking mental health, taking care of people that had mental health problems. But there's been some things that weakened some aspects of the mental health when it came to the database, where there was a fight to allow people that have had, if you get disability benefits because of mental health issues, you can still pass a background check. Should that be the case? Well, there were some people that we saw in that situation where they had, not mental health issues, they had disability issues. And yet because they were on that list, they were getting denied gun rights. Not because they had mental health issues, because they had disabilities. You shouldn't take away the rights of people to own a gun just because they have a disability, but still have good mental health capacity. Why do you think we do lead the world in these things, in gun deaths. We lead the world in these mass gun incidents. We lead the world in death by guns. We lead the world in how many guns per person we have in this country. If you look at some of the places where you have bad gun violence, and I mean, first of all, let's recognize that the vast majority of gun violence and gun killings in this country are committed by people who broke the law to get the gun. But you go to a city like Chicago, some of the toughest gun laws in the country are in the city of Chicago, and yet they have the worst gun violence. But they'll tell you, you just go in Gary, Indiana. So I mean, you just go across state lines. And you can have all the tough gun laws you want in the world, but if you cross state lines, I mean, this is, that's why they argue for a federal law. I do think something that doesn't get focused on enough are the amount of people across the country who, over the course of a day or a week or a month, use guns to protect themselves against criminals. Let me ask you this philosophically. Is there a limit? Is the right to bear arms unlimited or is there a limit? Look, the Second Amendment really predates the Bill of Rights. Our Founding Fathers believed strongly in gun rights for citizens. Frankly, they thought it was an assumed right. They didn't put it in the Constitution because they didn't think it would ever be in jeopardy, but ultimately you saw attempts later on to take away gun rights, so they said it's so important we're going to make it one of the ten Bill of Rights, constitutional changes. And so it is a long history in our country to make sure that you protect the right of citizens to bear arms. Well, you're right in a sense that there are already limits on the gun ownership. But frankly, let's go out and enforce those laws. Don't try to put new laws in place that don't fix these problems, they only make it harder for law abiding citizens to own a gun. So you do agree there should be some limitations. But you said there is-- would you have supported those limits at the time? Oh, I'm sure I would've supported some of them, but probably might have opposed others. But in the end, you have laws that are on the books that aren't being enforced. Go out and focus on enforcing those laws. Do you agree with the automatic weapons ban? If you look at, again, some of the weapons that they included in there aren't really automatic weapons. But those laws are on the books too. And again, you haven't seen a decrease in gun violence with those laws on the books. So go and enforce the laws that are there. All right. What do you make of this bump stock, of this accessory that takes a semiautomatic weapon and turns it into virtually an automatic weapon? But you're not ready to codify it in the law? Well, again, I mean, a week ago nobody, most people, didn't know, a few people, but most people didn't know what a bump stock was. So to think that we're now all experts and know how to write some, you know, panacea law, it's fallacy. Let's focus on the facts. Let's get the facts and let's go focus on some of the problems. And frankly, we've done some of that already. Is there a point where somebody's right to bear arms infringes on somebody else's right to be safe and secure at a country music concert? Absolutely. You know, if they break the law and take away your rights, you know, you've got a right to be protected, in your home and when you're out in public. And if you're abiding by the law, nobody has the right, whether it's a gun or a hammer or a knife to go and deny your rights by trying to attack you. We're learning that this guy stockpiled a lot of weapons, a lot, over the last year. We don't necessarily monitor that type of sales. I know there's always been some concerns about that. Had we been monitoring, he might have gotten a check in from the F.B.I. or A.T.F. that's going, "What are you up to?" And maybe that might have intervened. Is that something you could imagine ever supporting, the idea that there is a limit on how many guns you buy in a year, in a month, in a week? I understand that line. I get that argument. But it's really happening. Frankly, go back to after Katrina. We saw law enforcement going door to door in the city of New Orleans taking guns from law abiding citizens. That happened in the United States of America in 2005. It should've never happened. We put laws on the books to stop government from taking guns, but government, and other governments we've seen over history, have used those lists to take guns away from law abiding citizens. Do you think we have too many guns on the streets? The problem is not that there are too many guns. It's that there are people that will go out and break the law, whether it's a gun or some other weapon or a bomb. There's no excuse for breaking the law. There's no excuse for using any kind of weapon to try to take the life of an innocent person. One more note I want to share with you: on Friday night, Congressman Scalise was at Nationals Park right here in Washington, D.C. to throw out the ceremonial first pitch of the first playoff game between the Washington Nationals and the Chicago Cubs. By the way, he threw a strike. His optimism is extraordinarily contagious. Let’s just say, after the interview, I was more fired up than ever before. Anyway, Democrats, of course, have taken a very different position on guns. In 1978, Sen. Dianne Feinstein of California became mayor of San Francisco when the mayor, George Moscone, and City Supervisor Harvey Milk were shot to death by a colleague. This week, Feinstein, introduced a bill to ban bump stocks. Well, I spoke with her yesterday and pointed out that this is the least ambitious of the more than a dozen gun bills she has introduced over the years. And I asked her what that says about the state of the gun debate. Well. The state is sad. America is a gun-happy country. And I think there are many of us in growing numbers that don't want a gun-happy country. Guns have their place. I don't have a problem if they're used properly. But what I have seen over the decades is a growth of substantial improper use of weapons. Beginning with the Texas Bell Tower, you've seen law offices, you've seen businesses, you've seen movie theaters, you've seen high schools, you've seen colleges, you've seen a primary school with first graders in it, 20 of them killed. And now you see a great American classic, which is country music, people by the thousands out in a safe place, with a big hotel in the background. And somebody comes along. He has been legal. He's gotten his weapons legally. He has 40 weapons. He has 12 of these bump stocks. They are on the weapons. And he begins to fire a weapon that fires similar to a machine gun out of two broken hotel windows. Every American can look at, should look at those pictures, and say, "Do we want more of this?" This is one simple thing that stops the making of a semiautomatic weapon into a machine gun. Let me ask you this. Give me the slate of laws, that if you could wave your wand and have enacted that could have prevented Vegas. Well. I don't know. I would have to take a good look at that and really study it. I'm not sure there is any set of laws that could have prevented it. I do know this. That we have a Second Amendment. There's been difference over its interpretation by the court, the high court. Nonetheless, the high court has held. And the, and possession of firearms is legal under the Second Amendment. Now possession of machine guns is not legal under the Second Amendment. The National Firearms Act said, "They were not legal." Ergo, now you have people with American inventiveness inventing something that can be added. An additive that boosts the firing rate to that of a machine gun. And that's what every American saw coming out of those hotel windows. So you've heard Congressman Scalise there. He really outlines, though, a set of reasons why he believes all of these various attempts at gun control infringe upon those rights. And Senator, that seems to be the poles that we're at here and why it seems as if frankly both sides in this talk past each other, not to each other. Well. I don't agree with that. First of all, let me say, I'm delighted that he's back at work. He's obviously a very strong man. All I can say is, "Right on. Continue Mr. Congressman." I'm very happy. That's one good thing this week. I don't agree with that. There is still a lot of dissent over the court's decision with respect to the Second Amendment. Be that as it may, the court has decided and Americans generally fall in line. So let's say, from the perspective of this decision, it is legal for an American to carry a weapon. It's legal for them to drive a car. However, they register that car. We should perhaps look. And the N.R.A. says, you know, "Guns don't kill people. People kill people." Well, cars don't kill people. People driving them kill people. And so there are a lot of things that could be done to make it safer. But every single one has been opposed by a very powerful organization that then goes out to get any congressman or senator that votes to the contrary. And that's a fact of life. Are you okay if this ends up being a regulatory change by A.T.F.? Or does this have to be codified by Congress in your view? Well, my view, it has to be codified by Congress. It can be changed if it's a regulatory change. It can be changed any time. And, look, how many events do we want to have happen with these devices now before we do something about it? The California Republican Party has been calling on you to return or donate to charity the campaign contributions you've received in the past from, uh, Harvey Weinstein, the movie mogul that is, there are some explosive sexual harassment allegations against him. Do you plan to do that or have you already done that? I-I don't know that I've received any. I'll certainly take a look and then I'll make a decision. There were some. They-they found some about 20, 20-odd years ago on that front. So any of that money you plan on getting rid of or not? on any of this stuff, um, somebody comes to you and says, "Oh, they contributed to you, are you giving back the money?" And y-y-you sort of look like a startled bird and say, "Well, let me look and see." And that's the best I can do for you today. Senator Feinstein, one last question. Are you running for reelection? You are going to find out about that very shortly. What do you make of the poll recently? 50 percent say they don't know if they want to see you run for reelection again. Oh look. There are polls and then there are polls. I'm ready for a good fight. I've got things to fight for. I'm in a position where I can be effective, and hopefully that means something to California. Well, that sounds like you've just announced your reelection bid. Close? Thank you, Chuck. Thank you, bye. You can see both of my interviews in their entirety with both Congressman Scalise and Senator Feinstein on our website MeetThePress.com. We get into a lot of issues with both of them, not just the gun issues. Coming up, we're going to be talking about this issue, where is the line and is there a line when it comes to the rights between to bear arms and those rights about going to that country music festival and feeling safe and secure? More at bat when we come back. Welcome back, the panel is here. Hugh Hewitt, host on the Salem Radio Network and at MSNBC, has his own show here on Saturdays. MSNBC- NBC News White House correspondent Kristen Welker, Carol Lee, one of our newest national political reporters right here at NBC News, and last but not least, The Washington Post's Eugene Robinson.Let me just throw the conversation this way. Gene and Hugh, I want you both to get in on this, everybody. Here's Peggy Noonan, "And here is the horror for me of Las Vegas. I was not shattered. That shatters me," she writes. "It's not the new normal, it is the new abnormal and deep down we know it's not going to stop." Well, no. It's not going to stop. And, you know, these things happen, they're awful, they're tragic. And then we start the gun debate non-debate. Because one reason it's a non-debate is that we debate, "Well, what specific piece of legislation could have stopped this incident?" And you can never put your finger on it. And therefore you can't talk about any piece of legislation that might have stopped the last one or might stop the next one.Meanwhile, there are 300 million guns in this country. And so a real gun debate has to look at that fact: 300 million guns. And we need, you know, to look at what was done in a place like Australia where they had a gun buyback. And gun control is permissible, according to the Supreme Court.And so if Congress were to decide, it won't happen, were to decide that automatic assault rifles, long guns, are something that, military-style weapons, are something that citizens should not have, they should be police and military only, and we're going to buy them back, that would have an impact. It's not going to happen. But that would have an impact. And that's what the debate ought to be. You're referring to Bret Stephens, look I'll throw it up here real quick. He was saying, "Repeal the Second Amendment." He said, "Americans who claim to be outraged by gun crimes should want to do something more than tinker at the margins of a legal regime that most of the developed world rightly considers nuts. They should want to change it fundamentally and permanently. There's only one way to do this. Repeal the Second Amendment." So he's honest. And I think the gun debate would be very much improved if people would admit that the Second Amendment is real and that conservatives will support constitutional and effective measures as a ban on bump stocks. The speaker of the House of Representatives told me he is open to hearings on that, as John Cornyn is, because it is effective and it is constitutional. I think one of the things that highlights how entrenched both sides are when it comes to this issue, everyone seems to agree something needs to be done about bump stocks, but there's no agreement about what to do. You have Republicans, the N.R.A. saying, "Let's do something to the executive branch. Let's just make sure that the regulations are in place.” Democrats are saying, "No," as you just heard Feinstein say to you. "We want to see some type of legislation." But in my conversations with Democrats, they say, "If we have legislation, we're going to try to put expanded background checks in that." And that's never going to pass. Well, but Carol, that's the issue, right? Is that Republicans leaders maybe don't want to see those votes on the floor. And that's a great outlook. I think you can't really have a good debate about guns in the wake of a tragedy, like we saw in Las Vegas. And that's how these conversations keep happening. When it happens outside of the raw pain that the country's feeling about something, then maybe it'll be a little bit more serious. But the idea that Republicans are softening on this, it's a tone that maybe a little bit different. But it's not a policy. Saying you want to kick this to the Bureau of Alcohol, Tobacco, and Firearms to review, when they've already reviewed it and said the bump stocks are legal under current law, means you're just trying to avoid any sort of actual legislation. And so, you know, until there’s actual- until the Congress actually does something, it's hard to see that issue being resolved. But the debate never gets- never sparks up when there's not an incident. There's never a good time to have the debate. Right? You don't have the debate when nothing happens, and then when the worst mass shooting in modern American history happens, if you don't talk about it then, when are you going to talk about it? You're never going to talk about it. And a lot of people feel as though the debate ended after Newtown, when you had 20 children who were killed and there was no legislation. There was no action in the wake of that. And so what is different this time? It is the worst mass shooting, but the politics haven’t changed. I want to go to something else that Peggy Noonan brought up. Because she goes, "We need to ask the question,why are- why is this plurality of Americans, it's not a majority, stockpiling so many guns?" --is that they are afraid. They're afraid not of confiscation. And I was unfamiliar with what Representative Scalise said about seizing guns in New Orleans after Katrina. But they are afraid of having to defend themselves. If in Puerto Rico, the power goes down, the grid goes down, there are legitimate fears. And that's why 35 percent to 45 percent of American households have a weapon. It does not account for people who stockpile. And I would suggest the one place where you might have a consensus is like with controlled narcotics. If people buy a lot of them in a short period of time, it triggers a red flag. Well, but you heard Congressman Scalise's response on that, because we know the N.R.A. fears the registration, okay? No, but how do you do both? You have to have great security in the age of Equifax, where people can break into data. But what you do is, if so many background checks are run in such a short period of time, you have a red flag. Well it’s- yeah, well, good luck. Good luck. Because the N.R.A. sees that as a registry. And so they'll fight it tooth and nail. Donald Trump was one time a gun control guy. And obviously, this is a big part of his, what is the conversation in the White House, Kristen? Conversation in the White House is we are open to having a discussion about bump stocks. But then when they're pressed, well, is the president going to lead that conversation? They say no. His role right now is to unify the country. I think he's torn. I think he's taking a hard look at this, I think this was personal. You saw Sarah Huckabee Sanders get choked up in the White House press briefing room. There was a shift. But what will the actual result be? I think that remains to be seen. Well, there's been a lot of tweet storms, Carol. He's been very reserved on this issue. He has. And I think Kristen's right in that he's a little bit torn. Look, he's not a traditional Republican in the way that the Republican party thinks about guns. And so we've seen in the past when, when there's shootings, or when children are involved in some sort of attack, that the president really gets, you know, uneasy with perhaps taking the traditional line that his party wants him to take. All right. I'm going to pause it here. Got a lot more to come- talk about later in the show. Coming up, in fact, what we've learned about Harvey Weinstein and the conspiracy of silence among those around him in Hollywood. But up next, whether or not he did call President Trump a name, there are real questions about Rex Tillerson's future. Will he remain secretary of State much longer? I'm going to talk to a top administration official about that and a lot more when we come back. Welcome back. Earlier, we mentioned the wash, rinse, repeat feeling that we got watching the Trump administration this week. NBC News ran a multiple-sourced story that Secretary of State Rex Tillerson called President Trump a moron. And that Tillerson had to be talked out of quitting. Now, the State Department denied parts of those stories. Tillerson denied only the quitting part. So is C.I.A. Director Mike Pompeo being considered as a Tillerson replacement? Is White House Chief of Staff John Kelly really talking about leaving? The White House dismisses all of it as rumors, but the openness of these West Wing leaks and conversations only adds to the sense of turmoil surrounding the administration again. Joining me now is a top administration official, the director of the Office of Management and Budget and a former member of the House of Representatives, Mick Mulvaney. Uh, Mick, welcome back. Let me start with this. John Kelly was brought in to be chief of staff to sort of cut down on what looked like public drama. From the outside, it looks like the drama’s back. Is it? No. And from the inside, there was never that much drama in the first place. What I can tell you has changed is the flow of information to the president, the flow of information from different people, from different sources. It is a much more orderly and aligned West Wing than it was previously. And I think the president is extraordinarily well-served by that. And, more importantly, likes it. I was surprised to hear you say in your intro that folks are talking about John Kelly leaving. That’s the very, very first I’ve ever heard that. I only ask it because it got sparked in a story on this. I guess let me ask you this: was the president getting bad information before? Was that an issue? When you said the flow of information, was he getting bad info.? It wasn’t bad info. It just wasn’t ready for the president. Not contradictory. Folks would wander in. You’ve heard there were several stories -- and those stories were actually true -- about folks would just come in and there was an open-door policy and they could wander in and talk to the president about anything. That’s probably not the most effective way to get information about very, very complex issues in front of the president of the United States. So what John has done is really refined that flow of information, so that we know, before the president sees it, it’s right, it’s accurate and it’s ready for him to act on. All right, you just said that said that you were shocked -- and expressed a lot of confidence in John Kelly. Does the president express that same level of confidence in Rex Tillerson? He does. And, again, I know you folks have reported about he considered leaving, um, I’ve talked to Rex this week. I spent a good bit of time with the president and with Chief Kelly on the way down to Puerto Rico, uh, on the way both down and back and the topic never even came up. So I look, sit back and look, and say, all right, Rex says it’s not true. I think the president tweeted last night it was “fake news.” You’re running the story. But you folks are really the only ones doing it. So as between you and the folks who are involved, I believe the folks who are involved. Let me ask you this. Senator Bob Corker made a comment in the middle of this week, in the middle of this controversy, where he said that Tillerson, secretary of state, Mattis, Chief of Staff Kelly, are “they help separate our country from chaos.” Do you agree with that? What do you make of that? I enjoy working with Senator Corker. I think it’s going to be fun to work with him, especially now that he’s not running for re-election, because I think it sort of unleashes him to do whatever -- and say whatever -- he wants to say. But I don’t think we’re that close to chaos anyway. The folks that he mentioned are excellent at their jobs, but most of the people that we hired have -- most of the stories I see -- and, again, I’m there, Chuck, every single day, I’m in the White House every single day and I’ve never seen the chaos that gets reported outside. I’ve never seen the infighting the back-biting. Certainly, there are differences of opinion. You and I have talked about this before. The president wants people who have different ideas and different perspectives than he does, so that he can get a bunch of smart people in a room to help him make a decision. That’s not chaos. That’s just good decision-making. This issue with the use of government planes or private planes, we learned more this week. In fact, since the last time you were on a Sunday show, we learned that you were on one of these flights with the secretary of Treasury. One that took, I guess you were on one leg of a flight that ended up just going to New York. Now you were only on one part of it. But you're a part of a new policy here. Has this policy been abused? It is not? You were not on one of these Treasury flights with the secretary of Treasury? Because you were on the manifest? Exactly. What's necessarily legal isn't necessarily right. And I think what we did was John Kelly and I last, we got together, and came out with this statement of policy that says, "Look, you can fly it, it's reasonable in certain circumstances, but it needs to be the hard exception." There's going to be times when Ryan Zinke needs to go to the Arctic Circle or Rick Perry needs to go to the middle of nowhere in the Nevada desert. Those places probably merit flying something other than commercial. But government planes to New York? You're not going to see it again. How about that? Fair enough. All right. Let me ask you about policy. The president had a little surprising tweet for us on Saturday morning, as he does sometimes. He said, quote, "I called Chuck Schumer yesterday to see if the Dems want to do a great healthcare bill. Obamacare is badly broken, big premiums. Who knows?" Is the president open, by calling Senator Schumer, the Democrat leader in the Senate, is he open to some sort of compromise that fixes that Obamacare but leaves it in place? Depends on your definition of it? That's exactly right. If the question is, is the president interested in working with Democrats to repeal and replace, that would be our language, the answer is yes. The Democrats may use a different word for that. But the president wants to get something done. He sees and understands what Obamacare is doing to folks back home. That's interesting. What message should Senate Republicans take away from this phone call? Some are upset. Keep your promises. You promised to repeal and replace, do it. You promised tax reform. Do it. Chuck, I used to be an elected official, I used to be a member of Congress. Now I'm just an ordinary resident of South Carolina. I have a senator, I have two senators. Well, you're also the budget director. But I vote. I have two senators and I have a member of Congress and I expect those men to deliver on their promises to repeal and replace and to do tax reform. All right. I want to go to tax reform. And I want to go to this issue of the deficit. Here's Congressman Mick Mulvaney on the importance of our debt and deficit. Take a look. How can we possibly have a credible discussion about the importance of the debt and the deficit and not include defense? More and more people are starting to recognize the threat to the overall economy, to the country, that the debt presents. Okay, now we ran up this debt, what are we going to do to try and make sure it doesn't happen again? I believe as a matter of principle that the debt is a problem that must be addressed sooner rather than later. All right. What has changed from Congressman Mulvaney on the debt and Budget Director Mulvaney when you said earlier this week, "We need new deficits to increase economic growth."? This is what's changed is that I've come to the realization that Washington is not going to solve the debt problem, the deficit problem, through spending. I had come to Washington in 2011 and had hoped that would be the case, that we had a spending problem and not a revenue problem. You've come to that because you acknowledge that there's only so much spending you can cut? No. There's a political will. We offered, for example, $54 billion worth of discretionary cuts in our budget this year. I think by the time it's over on Capitol Hill, four or five of those would be put into place. I just don't think there's much appetite to cut our way to balance. My emphasis on the debt and deficit and getting rid of it is the same as it was when I got here. It's just now I recognize the fact that the growth factor is going to have to be a bigger part of that. When we balanced the budget, Chuck, in the late 1990s, we did it with fiscal restraint. We didn't cut our way to balance. There were some actually tax hikes in there. There were fiscal restraints and growth. And growth is what drove it. You go back and you look at how we balanced the late 1990s. It was that go-go economy that increased government receipts, and that's what balanced the budget. And President Clinton raised taxes in 1993. He did. And he also did welfare reform, which dramatically reduced spending and moved more people into the workforce, which increased productivity growth. You're admitting that if tax reform passes, there's going to be a hole in the deficit. We are going to expand the deficit. You can't fully grow your way out of this anymore. You can. In fact, I think that's probably the only way you're going to get out of this is to grow your way out of it. We are willing to accept short-term increases in deficits in order to get the type of tax reform that we need to get back to that healthy American economy, that real healthy American economy. Remember, if you're 30 years old, you've never had a job as an adult in this country with a healthy American economy and we're trying to get back to that. On Sandy relief, when you were a congressman, you were for the relief, but you wanted some cuts with it. Why should hurricane relief for Harvey, Irma, Maria, now Nate, be handled the same way? We're not there yet. Keep in mind there's a couple different ways that we address disaster relief funding in this country. And right now, we're still at sort of the emergency, making sure people have drinking water, making sure people have electricity. But this is another thing that's changed for you since being a congressman? Sandy, was over the big piece. I think it was over $60 billion. And that was the money that New York, New Jersey, the other areas, wanted to rebuild after the storm. It was not the emergency money that was needed to keep people out of harm's way. What did the president mean when he said he was going to wipe away Puerto Rico's debt? And I know you corrected it, but explain, put it in layman's terms for me. Sure. And I did talk to him about this at length after the Puerto Rico trip. Puerto Rico is between $79 and $120 billion in debt, depending on how you want to count it. There is no way they are ever going to get back to prosperity with that debt hanging over them. And the PROMESA process, which was a bill that the House passed two years ago, is going to have to figure out a way to relieve Puerto Rico of that debt. That does not mean that we're going to wave a magic wand and wipe out the debt, which is what many people interpreted the president to say, and it also doesn't mean we're going to bail them out, because we're not. Oh no, listen, we are going to, well, to mitigate the debt. We are going to work with them to rebuild the island. There is no question about that. How they deal with their long-term debt is actually part of an existing piece of legislation called PROMESA. And speaking of that, I talked about the president's tweet storms over the weekend. He had a long one, lengthy one on North Korea, "Presidents and their administrations have been talking to North Korea for 25 years, agreements made, massive amounts of money paid, hasn't worked. Agreements violated before the ink was dry, making fools of the U.S. negotiators. Sorry, but only one thing will work." Do you have any clarity on what that one thing? First of all, that's the first I heard that specific tweet. But every sentence about that is true. But what's the one thing will work? Well, I think what the president's clearly telegraphing, and this should not be news to anybody, is that military options are on the table with North Korea. They absolutely are. Mick Mulvaney, Budget Director, utility issue infielder today as well. Thanks for coming on. Appreciate it. --Sharing your views. Coming up, why the N.R.A. keeps winning the debate in Congress. And we are back, Data Download time. Las Vegas has put gun control back in the center of debate in the country. But few seem to think there will actually be substantial movement on the issue. The reason may be best understood by looking at who owns guns and who is most invested in this debate. According to recent data from the Pew Research Center, 42% of all households in America have a gun in the home. That's not even half the country. And when we look at gun ownership by race, you see it this way: 49% of white households have a gun in the home, 32% of African-American households, and 21% of Hispanic households. There's a big rural/urban split, 58% of rural households own guns, compared to 41% of suburban homes, and only 29% of those who live in urban America. And not surprisingly, the partisan political divide is also evident on the question of gun ownership. More than half of all Republican households, 56% own a gun. That number is only 30% for Democratic homes. So we know who owns guns, but who actually cares the most about this issue? In a recent NBC News/Wall Street Journal poll, we asked, "Other than foreign policy, national defense, and the economy, which one or two issues impact how you vote in an election?" Well, guess what? Gun rights and gun control were number one overall at 35%. But look at the partisan breakdown on this answer. 47%, nearly half of Trump voters said the gun issue impacts how they vote in an election. It's a whopping 20 points higher than Clinton voters. Only 27% of them said the same thing. In other words, people who support gun rights vote on that issue. Opponents, they don't vote as often, or with as much passion. Look, there's a long list of reasons why gun-control advocates will have a hard time tightening gun laws, including politicians' fears of being opposed by the gun lobby. When you look at the numbers though, one side is clearly more invested in this debate than the other. And in politics, enthusiasm does matter. And on this issue, gun rights advocates have a crucial edge. When we come back, End Game, and a conspiracy of silence with some hypocrisy thrown in. What we learned this week about Harvey Weinstein. Back now with end game. I want to get to the Harvey Weinstein stuff in a minute, but Carol, uh I asked the uh Budget Director Mick Mulvaney about the Rex Tillerson dustup. He is was very comfortable pushing back by saying, "Hey, you you at NBC News are the ones reporting this." Where are we right now with this Rex Tillerson story and the president? Um, and I say this, before you answer, let me tell--let me show you what the president said last night. We have a very good relationship. We disagree on a couple of things. Sometimes I'd like him to be a little bit tougher. But other than that, we have a very good relationship. Okay. What did that mean? Yeah, well first I'd like to point out that Director Mulvaney is actually incorrect when he said that we are the only ones that are reporting this. We were first. But there are plenty of other very reputable news organizations that are also reporting the same thing. I don't know exactly what the president meant by that, but except that he has decided that it's in his interest to back Rex Tillerson publicly uh as much as he can. But also, at the same time, he can't avoid saying that, you know, he-- they have their differences and he would like him to be tougher. Rex Tillerson being tougher, and by that he means defending the president is has been one of the issues in their relationship, so. --it doesn't work. Secondly, there's a tactical reason. You send Pompeo and Cotton to confirmation hearings, they both have access to the data which will allow them to say there is no "there" there in the Russian story. And that is an interesting point. And it just seems like an untenable situation. The comments that we just heard from the president undercut the secretary of State. And it is the latest example of that, he's done it on a whole range of issues. "I was just a product of the culture of the '60s and '70s." --you know, who's been very aggressive about promoting feminism and promoting the rights of women and he-here was somebody who publicly promoted it and practiced hypocrisy. Yeah, let's get that done. Yeah. Carol, the disturbing part has been how there's been this "what-aboutism" on both sides where on the left it's sort of like, "Well, yeah, Harvey Weinstein's bad, but look at the president." And on the right, going, "You chastised the president, but look at Harvey Weinstein." You're like, "Wait a minute, why isn't there a collective agreement that it's all disgusting behavior?" Right. None of this is okay. Right? Like, can we all agree on that? Um the thing that I found most disturbing about this was the number of people that knew within the organization, within Hollywood, and that nobody said anything. And I think if you want to talk about the politics of this, there are Democrats are probably going to have to answer whether or not any of them know about any of this, whether there was talk about that among them, because they were so entwined with Harvey Weinstein in terms of raising--fundraising. --Harvey Weinstein. And I do think though there's a part of this that transcends politics, which is that you now have women speaking out and saying, "They're not going to accept this type of behavior." And I think the hope is uh that that sends a message to this generation. But here you had women who had a soapbox, who were prominent women. --this sort of thing can still go on and women can still be powerless. You've got to give Ashley Judd credit. All right? That that took guts to do what she did. Very quickly, Kristen, I know you've got a little scoop here. Nick Ayers, or chief of Staff of the vice president talked about a purge of the party. We've heard Steve Bannon, the former advisor to the president talking about going after the establishment. How serious is this civil war in the Republican party, and is it going to play out in the Senate battlefield? All right. Missouri and Nebraska, those aren't states you want to be messing around with and adding to the Democratic target map. Count me as unimpressed with Steve Bannon's threats. Because I think Alabama is a category of one and I believe that Marsha Blackburn is going to win handedly in Tennessee and I think this is, I do believe they intend to do it. I think your reporting's right. I just don't think it's going to work. It does make -- makes the Senate map suddenly a lot more interesting when we thought it wouldn't be. All right. That's all we have for today. Thank you for watching. We always do appreciate it. We'll be back next week, because if it's Sunday, it's Meet the Press.